So far, my day sounds a lot like Kay's. I love slothful Saturdays. My kids are (finally) dressed, I've had lots of coffee, and I haven't really accomplished anything yet. But I'm a little afraid to face the piles of laundry upstairs. So, instead, I took a picture of my new project! You might ask why I am starting a scarf in worsted weight wool in May while I have two almost completed spring/summer items lying abandoned in a heap. Maybe it's the lure of new love, new yarn, new beginnings, as of yet unsullied by the dramas and disappointments of daily life. Or maybe it's ADHD. Or my fear of finishing. Or PMS. You tell me. 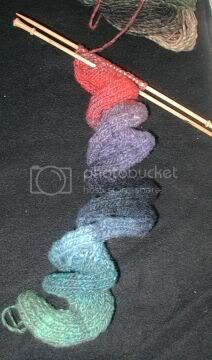 *The yarn--of course--is Noro Kureyon. Not a bit cuddly, but I love watching the color progression come out in this pattern. For those who care, I did alter the pattern a bit. Initially I cast on the required number of stitches, but I found that this made a scarf that was too wide for my liking. So I started over with four fewer stitches, and I skip the first row of each pattern repeat. Makes for fewer short rows and speedy progress.